Igor Shkurin's Logical Theory of Civilization provides a basis for the objective and impartial study of the history of civilization from ancient times to the present. 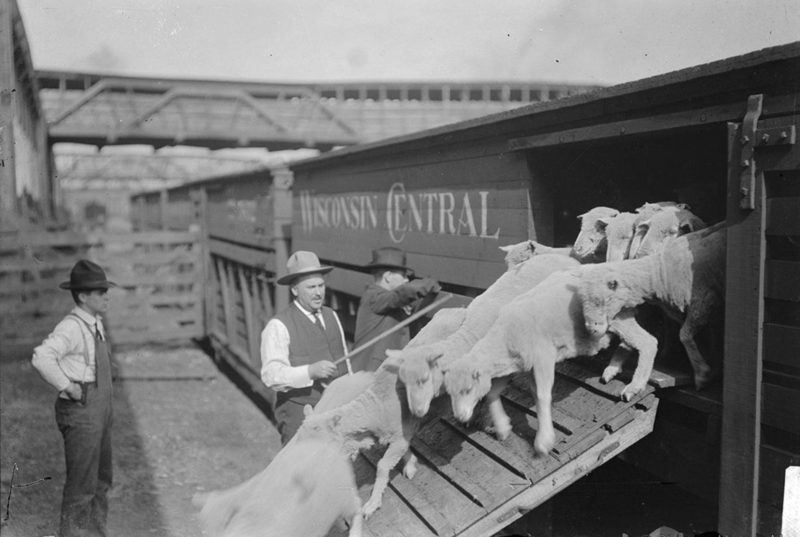 A continuous stream of settlers moved from New York to Chicago via the Erie Canal through the Wild West. They were the pioneer explorers who, for the first time, led a semi-natural economy with minimal dependence on civilization. Then it started the widespread tradition of free possession of firearms in the United States, the elected sheriffs, the special customs, the laws in the cities, and other characteristics of independent existence in relation to a central authority. 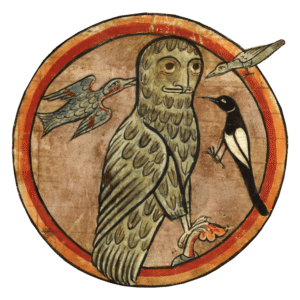 But we have not talked about resources yet, the most compelling magnet that drives all civilization processes. The territories of the savage Northwest that later became the states of Indiana, Michigan, and Ohio, had abundant forests, valuable minerals, and fertile land for agriculture. They could and needed to be explored and cultivated. The concept of "free land" is extremely relative. The lands were certainly free of settlers but occupied by Native Americans, gigantic herds of tens of millions of heads of wild cows, buffalo (American bison) and wild Mustang horses. In short - about hundreds of millions of heads of wild cattle, not considering smaller animals. And all this natural wealth needed to be swept away to enable the activities of the immigrant farmers. A great challenge requires considerable effort. But there were so many wild animals that dealing with them successfully would only happen in 50 years. So they killed the buffaloes and removed only their skin, to solve the main task - depriving the natives of food according to the principle of "a dead bison - a dead native." Wild Mustang horses were slaughtered by entire army divisions. 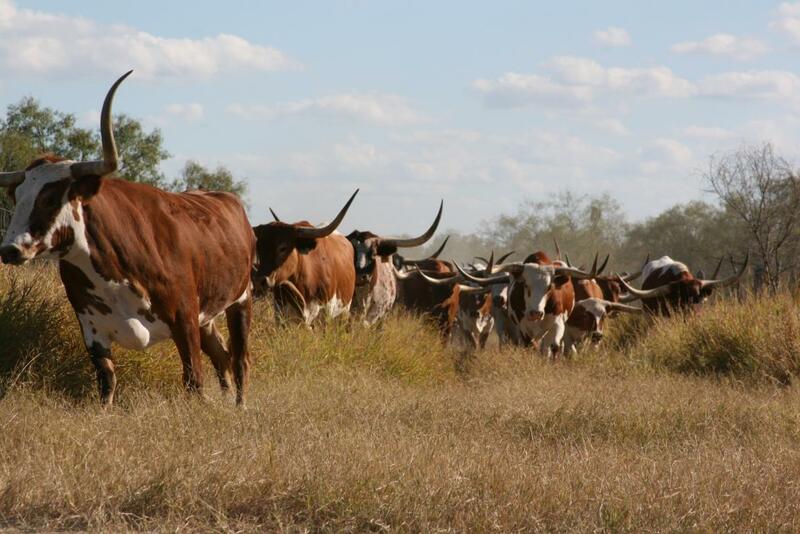 But with the wild Longhorn cows were successful in using the complete program. 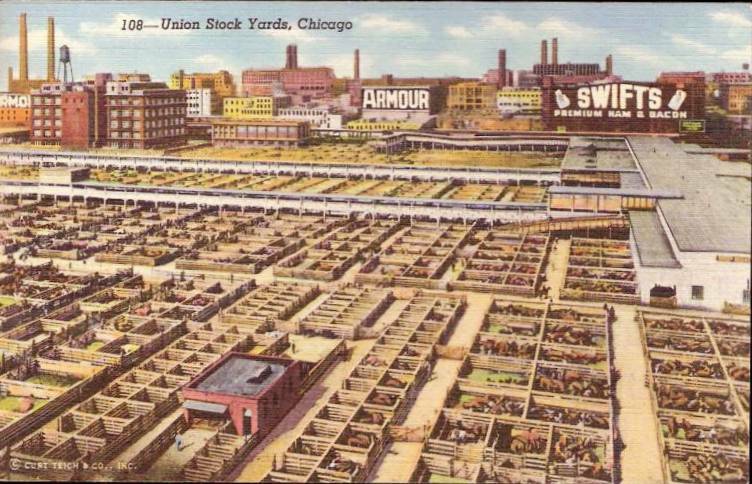 Unlike buffaloes and horses, they could be processed at a meat factory in Chicago. In addition, the Longhorn had the extraordinary feature of not losing weight as domestic cows and even gain weight with the lower feed during the stage. It was precisely at that time that the cowboys emerged, as well as the American tradition of steak, horse jumps and wild buffaloes, the sport of catching bulls with the help of a lasso, and so on. 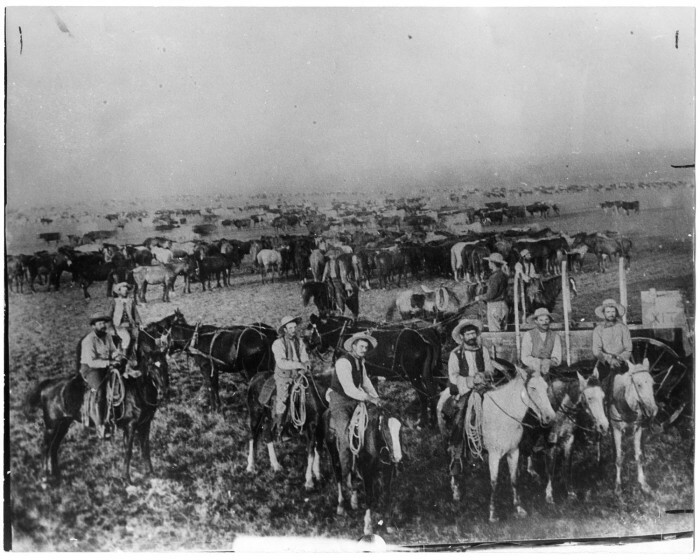 Cowboys first formed herds of wild cows and drove them specifically to Chicago and then to the vicinity of purchase points set up near railway stations. When they received money, on the way back the cowboys spent all their time drinking in the "saloons" and only this part of their lives received particular attention from the cinema. When the wild cattle disappeared, the profession of cowboy was extinguished as a bold guide. The activity and the celebrated massacre were violently reduced and the "Golden Age of American cattle" ceased. There are sometimes claims that these cattle were raised by immigrants. 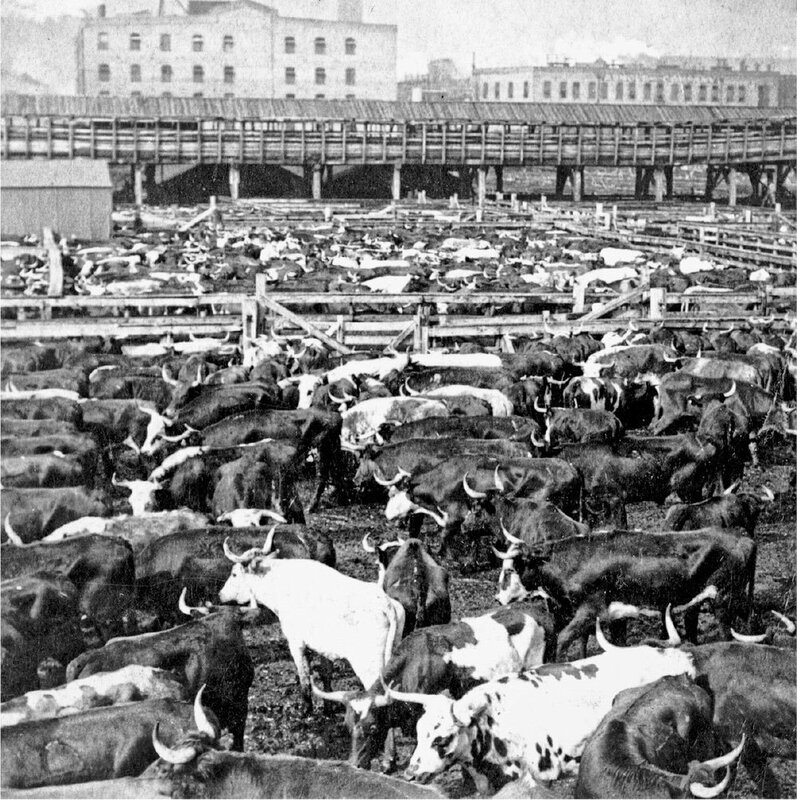 Well, it was only in 1862 that they were invited to the exploration of the Wild West and to there they drove en masse and by 1865 the slaughterhouse in Chicago had already begun to function. 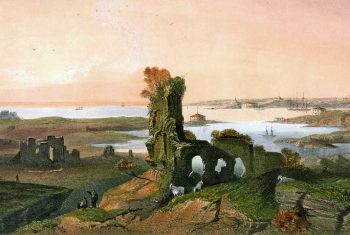 It was only in the 20th century, due to the work of the immigrants, that the variety of animals slaughtered became wider, with domestic cows, sheep and pigs. Chicago is often called the "second capital of the United States" and "capital of industry." 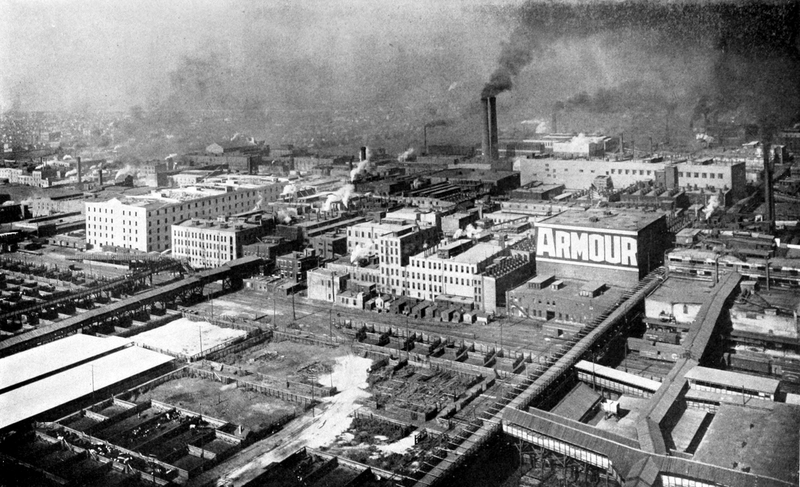 Without depreciating the importance of the lumber industry and port for the formation of Chicago, the essential activity in the formation of the city, which most deserves detailed description, is the famous slaughterhouse of Chicago because its technological equipment was a miracle of the 19th century and its activities would give rise to a colossal structure of associated companies. In the slaughterhouse dependencies worked from 25,000 to 50,000 people, depending on the season. 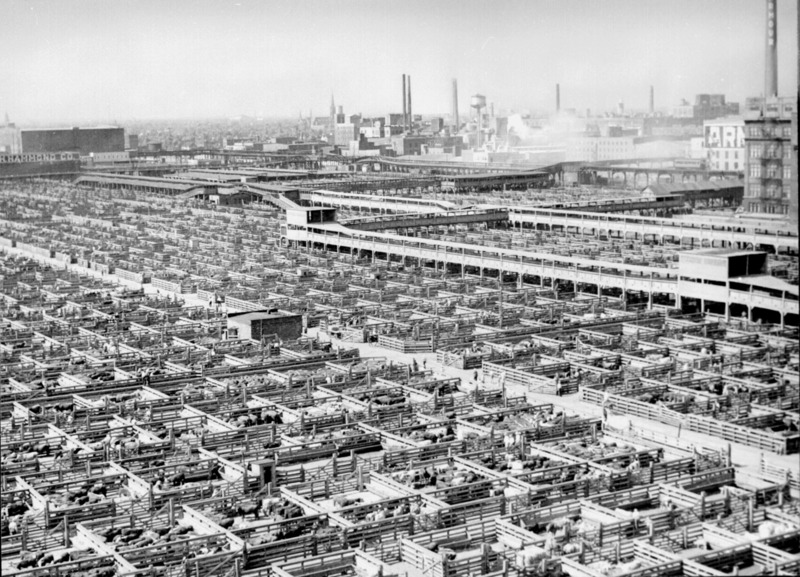 The assembly line was introduced into the slaughterhouse long before Henry Ford. The work was organized in such a way that each worker knew only one stage of the operation. The carcasses of the animals were transferred from worker to worker by the roof, on a sloping track, using only the force of gravity, and climbed in an elevator or were loaded on electric trains, if necessary. In storage and packaging there was own assembly line. Hot water and central electricity were distributed throughout the slaughterhouse area. Two large rolling racks of Armour, which was the largest company, allowed in the peak to kill 1,200 animals per hour, 16 hours a day (more than 20 animals per minute, three seconds each). 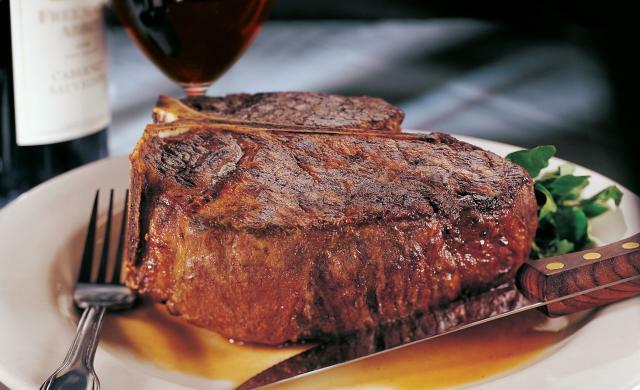 In the 1860s, 9 million head of cattle annually were slaughtered and 82% of US beef was produced there. Everything was in progress: in addition to canning factories and refrigerated trucks, in the slaughterhouse were being built halls and factories to produce leather, soap, fertilizer, glue, artificial ivory, gelatin, rubber, buttons, perfumes, medicines, food, ropes etc. In 1872, for the cooling of the meat, began the collection of the winter ice and its use in industrial scale. This allowed the slaughterhouse not to depend on seasonality and to continue the work in the warmer months. In 1882, Gustav Swift invented the ice-cooled wagon, which significantly increases the possibilities of transporting meat, especially to the populous eastern states, on the Atlantic coast. 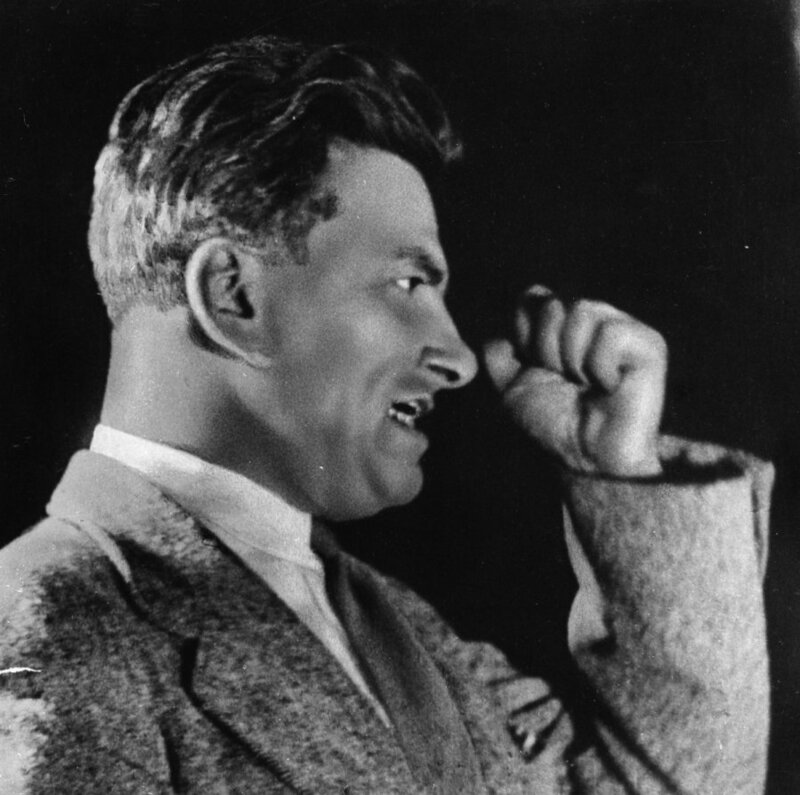 Vladimir Mayakovsky echoed the massacre in 1925: "Here a scream and a snore and on the other side of the factory already put a seal on the ham, a rain of conserve cans emit lightning flashing in the sun, then embark in the refrigerator - and express trains and steamers carry ham sausage to restaurants around the world. " Most of the products were exported to New York. In 1870, the Chicago Railroad reached the Missouri River, near Kansas City, and then stretched as far as Nebraska to connect with the Union Pacific railroad. 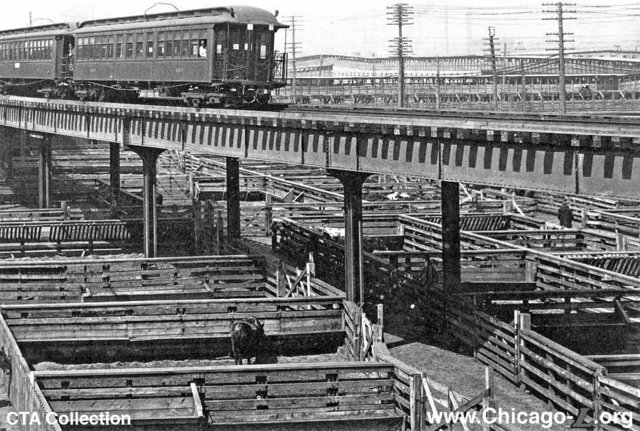 The Chicago railroads sprouted across the great American plains like blood vessels. 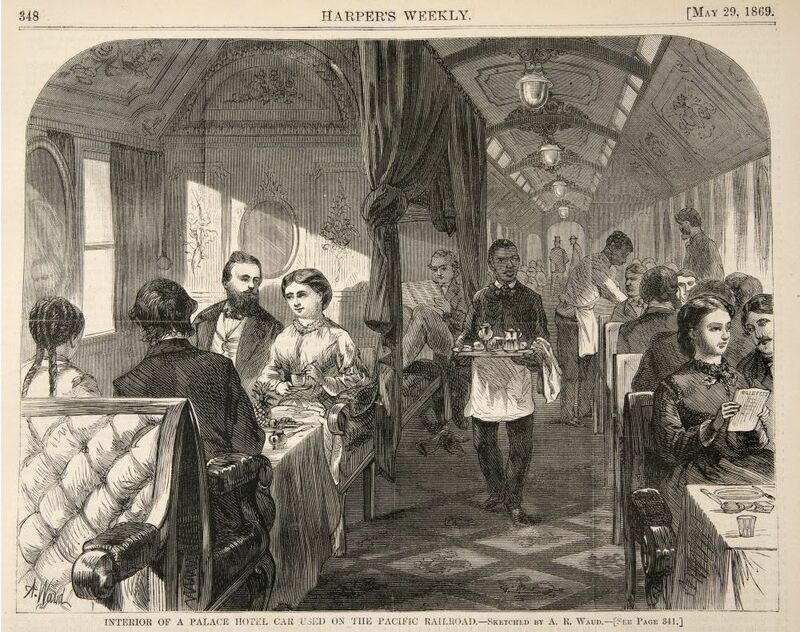 In addition to the aforementioned Swift refrigerated wagons, the activity of the famous Pullman train began in Chicago in 1863, with its high-comfort wagons, which, in fact, created the standard of rail service we now interpret as suitable: restaurant car, sleeping accommodations, toiletries and more. In 1867, in an alliance with the celebrated businessman Andrew Carnegie in Chicago, the Pullman Palace Car Company is created. 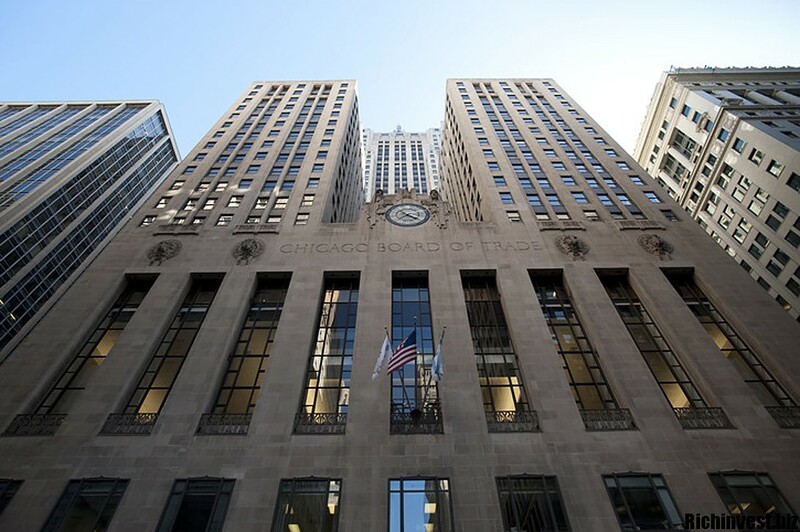 With the opening of the Michigan-Illinois Canal in 1848, Midwest farmers began to travel to Chicago to sell grain crops, and that is why a group of 82 grain trade entrepreneurs founded the Chicago Trade Exchange, the oldest and, today, one of the largest futures exchanges in the world. Officially, it is considered that the time of the first futures contract appeared in 1865, when the Chicago Board of Trade undertook its first step of self-regulation to trade the grain: future cereal contracts (farmers were buying a vintage future). 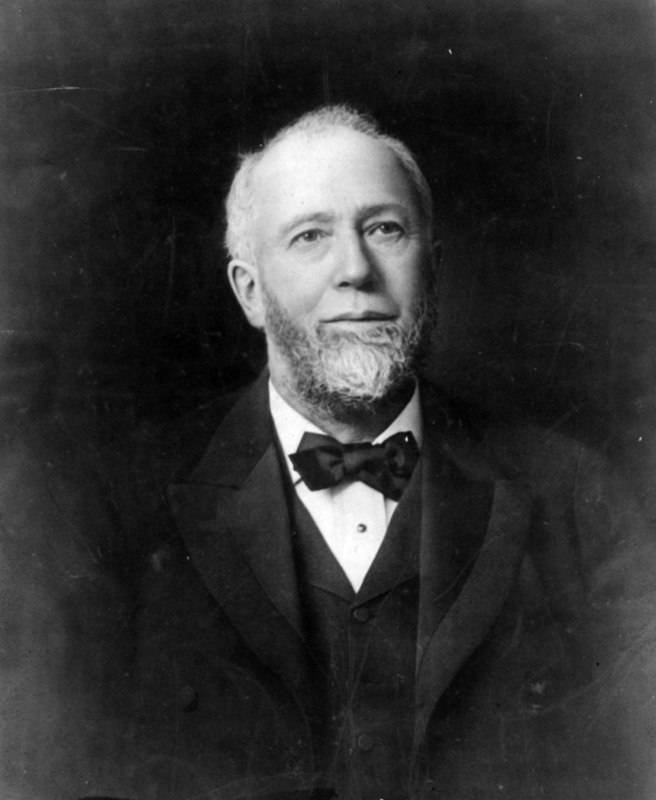 It should be noted that the New York Mercantile Exchange (NYMEX), which trades futures contracts, was established well afterwards in 1882. Now it is the first in the world ranking in volume trading oil futures, but started with the same agricultural products of Chicago - eggs, oil, milk, grains. The liberated territories were occupied by the concept of encircled spaces, already developed by the British. Only here, as the trees were scarce on the great plains, the aid came in the form of the barbed wire, invented on this occasion in Illinois in the early 1870s, to prevent the penetration of wild animals into the land and keep the domestic animals in the pasture. In the United States, 270 tons of barbed wire were produced in 1875, and by 1900, production had increased to 150,000 tons. 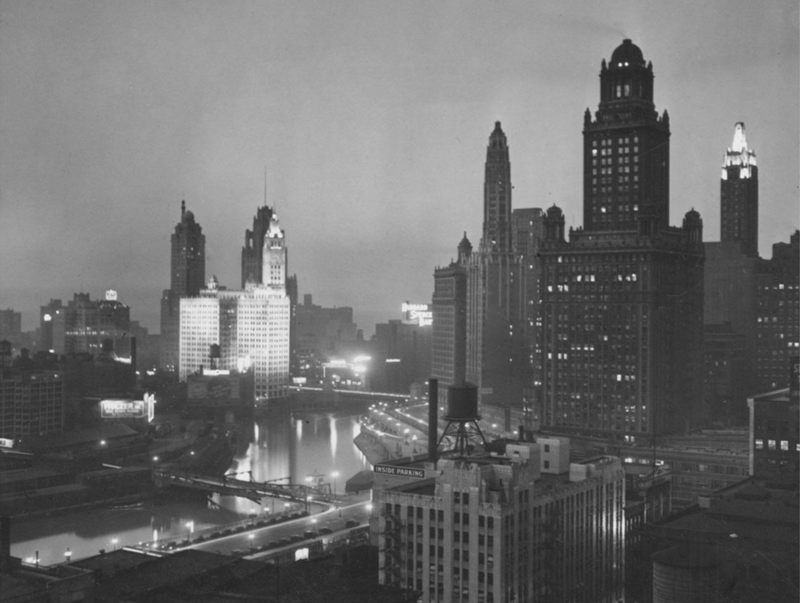 In Chicago, many things were the first in the world. For example, after the fire of 1871, Chicago began to rebuild itself again and by 1885 had erected the world's first tall building. Chicago skyscrapers, by the end of the 19th century, were so impressive in design that named one of the areas of architecture - the Chicago school. We are forced to describe each element separately but, in fact, everything happened simultaneously. In just 30 years, from 1840 to 1870, the population of Chicago increased from 4 to 300 thousand people. Chicago has become the second largest city in the United States, thanks exclusively to access to valuable resources and good transportation lines to New York Harbor. If someone does not know the logistical significance of Chicago - the industrial suburb of New York, though separated by hundreds of miles - this phenomenon of the explosive growth of both cities will not be clear.